SVA has decided to publish different data (geometries, reports and videos), which are related to propeller flow. The intention is to provide comprehensive material for validation purposes and is addressed to all universities, research groups and companies which are engaged in this work field. The core of the data is related to the Potsdam Propeller Test Case (PPTC), investigations with a controllable pitch propeller, which were used in the propeller workshops at the smp’11 and smp’15. 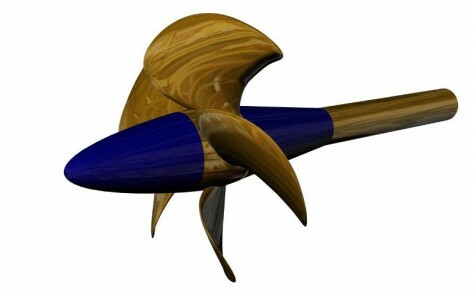 However, also data for an unconventional ‘tip rake’ propeller can be found. This data is published in course of an ITTC benchmark. The data are free to download and free to use. However, we only kindly request that the SVA is mentioned as source of the data. Thank you. So we hope that we could raise your interest and hope that the data falls on fruitful grounds and helps you somehow with your work. We intend to continue with propeller related publications on this site. Please return back to this site from time to time and have an update of our published work and data. CAD Geometry of PPTC Propeller.